It's citrus season, when some of my favorite fruits are in plentiful supply. All winter, I keep a basket filled with navel oranges and clementines or mandarins on my kitchen counter. They look pretty and they're an easy, good-for-you snack. I send them to school in the small Bears' lunchboxes and I've been know to toss a couple pieces in my bag before leaving the house myself. After the excesses of December (both dietary and monetary), it's nice to have a cheap, healthy and eminently portable food that still feels like a treat. Last week, I saw some beautiful tangelos in the grocery store. They were very affordable too, and I immediately thought about making marmalade with them. I hadn't made marmalade in two years; the plum-apple jam I'd made the summer before last was so plentiful that I felt we should finish it all before I did much more preserving. We finished it by the middle of this past summer. The time for new marmalade had come. Have you had a tangelo? It's an interesting fruit, a hybrid of a tangerine and a grapefruit. The skins are deep orange, like a tangerine, and the fruit itself is quite tart with a nice citrus tingle. You can definitely taste both "parent" fruits in a tangelo, and they can be very juicy. These tangelos were really ripe so they were especially full of juice. Would you like to try making tangelo marmalade? I followed a basic marmalade recipe, ending up with five half-pints of delicious tangelo marmalade for my pantry. Prepare jam jars, rings and lids. There are lots of ways to do this, but I like to heat and sterilize my jars on a pile of newspaper in a very low oven, 200 degrees. The lids and rings go in a saucepan of water on the stove; bring to a boil and let simmer until needed. Wash the tangelos thoroughly. Halve the tangelos and extract the juice. Cut the peels into quarters and, using a sharp knife, slice the peels into very thin strips (I like long ribbons of peel in my marmalade but you can cut them as long or short as you like). Place juice, peels, sugar and water in a large pot. You can use a slotted spoon now to remove any seeds. Bring the mixture to a full boil over high heat, then turn the heat down to simmer (I added the bit of powdered pectin at this point; I wasn't sure if I really needed it, but I've come to look at it as jam-making insurance). The mixture will need to cook for at least 30 minutes (mine took close to 60 minutes before it was ready for canning). Test the fruit mixture on a saucer chilled in the freezer; properly cooked jam will set quickly on the cold surface (another way to tell: if you drag a finger through the cooled blob of jam on the plate and the finger track remains, the jam is ready). When the mixture is ready, ladle it into hot jars, leaving 1/4-inch head space and wiping rims with a wet paper towel. Quickly add hot lids and rings, screwing on until fingertip-tight. Process jars as desired (I follow USDA canning guidelines, adjusting for my location at high altitude). I filled and processed the four Kerr half-pint canning jars above, and partially filled a fifth jar, which I didn't process since we would be eating it right away. We ate it for lunch that day, while it was still a little warm, spread on sliced Italian bread. It was totally delicious. 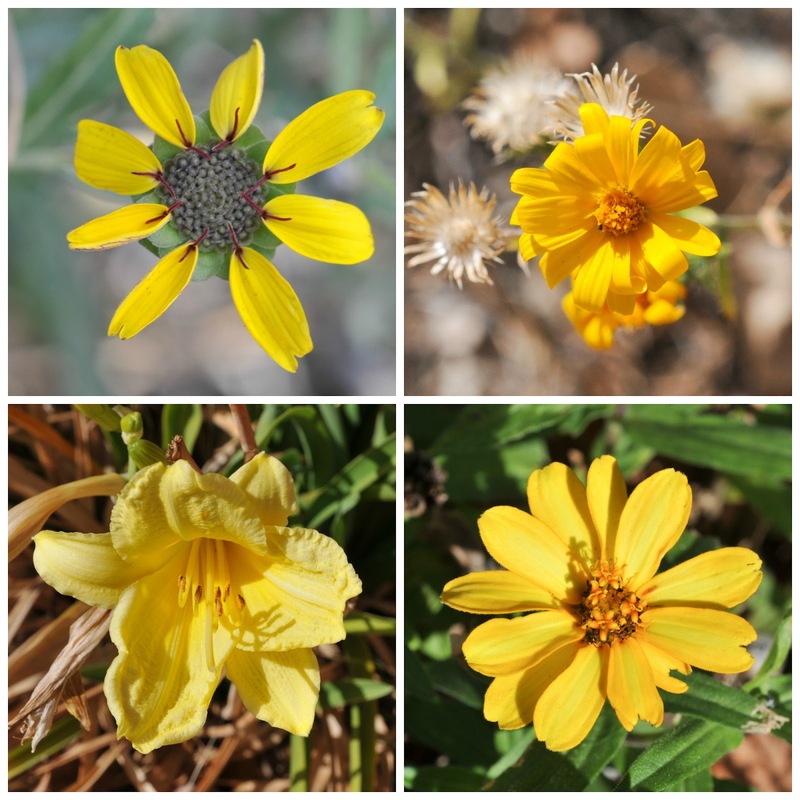 Cheerful too, the sweet-tart flavor and bright golden-orange color both very welcome in blustery, often-gray January. You may find this strange, but I truly enjoy making the beds. I like all the parts of bed-making: the straightening, the pulling-up, the smoothing and tightening. It's an important ritual in my day. This week, I was performing the usual mid-winter bedding blitz, where I wash every piece of bedding from all three beds in our house. The washer and dryer run all day long, a long procession of blankets and quilts emerging clean and fluffy. January is a good time for freshening most things, including bedding. 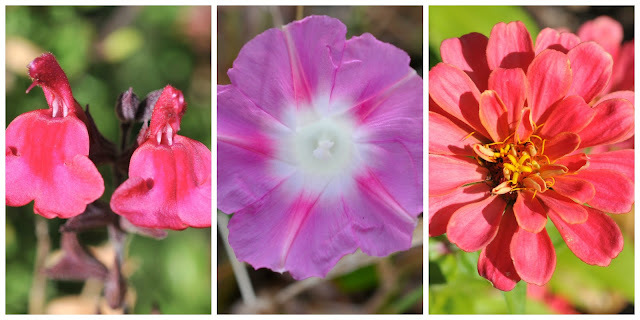 Winter is far from over, and we'll need the heavy-duty blankets for quite a while longer. I feel very accomplished when all the beds are put back together; the bedrooms look neater and everything smells like fabric softener for a few days. 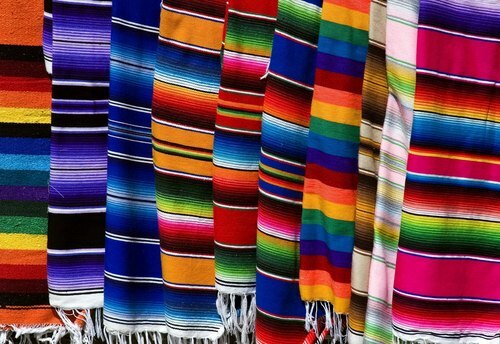 A serape is a traditional blanket from Mexico, probably brought by colonists from Spain. 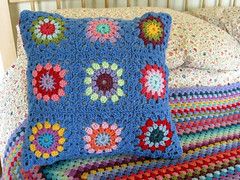 It can be used on a bed, or it can be worn poncho-style, via a hole cut through the center and pulled over the head, or hung on walls as decoration. They're almost always very brightly colored. Serapes used to be accessible to only the very rich before modern factory weaving. I'd think this is probably true for the blankets used by most cultures of the world; they would have been slower to produce, and therefore much more expensive, in the days when blankets were always hand-woven. I think serapes are really beautiful, with their colorful omber shading and bold stripes or diamond shapes, and I feel a bit sorry that they mostly bring to mind Mexican restaurant decor. Pretty, though, and likely just right for the hot days and cold nights in Mexico. Native American blankets have sort of a convoluted history, in that they were probably made in imitation of European blankets that the Indians received in trading with the Europeans; the Europeans were imitating traditional Native American artistic designs themselves. There is a little of both cultures in these blankets. In the 20th century, textile companies like Pendleton began producing blankets of this type for for sale to the Native market, and later for general sale. Indian blankets are still made by hand sometimes today, by Navajo and Pueblo Indian craftspeople trained in the art of creating their bold, colorful stripes and geometric patterns, but most are made on automated looms. Some Indian blankets also feature pictorial designs, such as the yellow birds on this blanket. They have been used in various ceremonies and rituals such as weddings and burials and have been traditionally given as gifts. 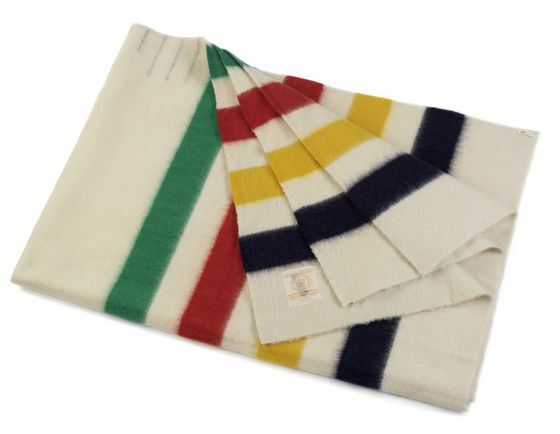 One of my personal favorite blankets is the Hudson Bay blanket (not that I personally own one; they're very pricey). This is a wool blanket, sometimes known as a "chief's blanket," made by the Hudson Bay Company for trade with Native Americans starting in the 18th century. 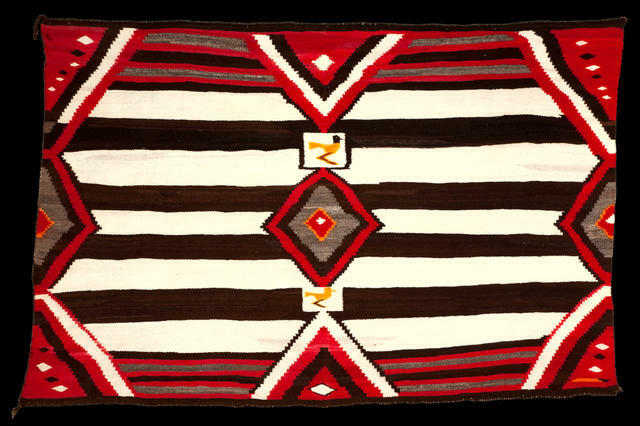 These blankets feature brightly colored stripes on a white background, along with a woven design on the edge of the blanket which once symbolized the value of the blanket in terms of its trade equivalent in beaver pelts or other animal skins. These blankets were very popular; their off-white color made for good camouflage in the snow, and the woolen material was good at repelling water. I don't think most modern users of these blankets worry much about camouflage or water-shedding, but they're still popular today because they're so sturdy and warm. Finally, I was reminded of the nubby, snow-white spread on my parents' bed when I was little. 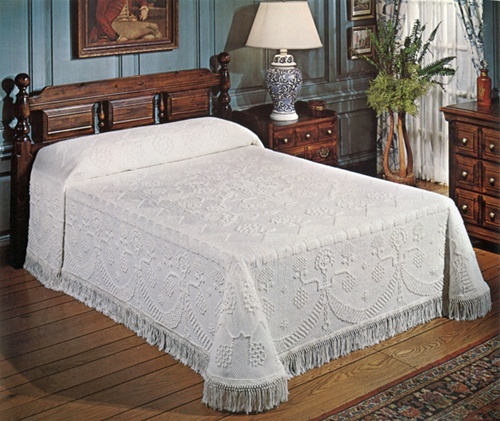 Theirs was similar to the one above, called a Martha Washington bedspread. Do you remember these? You don't see them much anymore but I can remember most of my relatives having them. These bedspreads have been made on machine looms for a long time, but they were originally handwoven. George Washington gave a blanket like this to his bride when they were married, hence the popular name. It's a very heavy cotton weave, usually in pure white, and it would be used as a top layer on the bed, but not necessarily slept under. I think these blankets have a formality, a hotel-like stiffness, that I don't desire for my own bedroom, but I find their elaborate woven designs very impressive. Blankets, where would we be without them? Shivering in our beds, I think. How do you like your bed to be made? 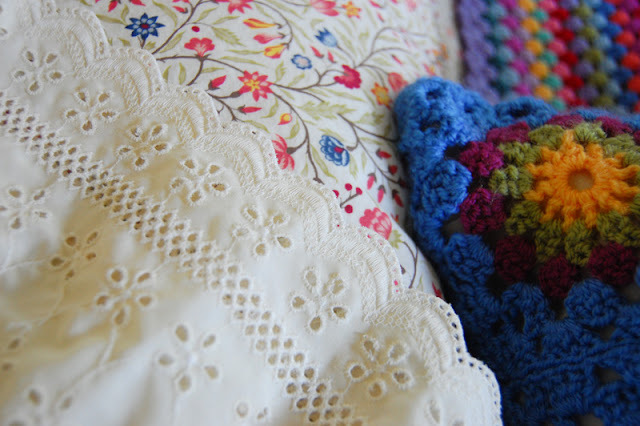 Do you have a favorite type of blanket? Around here, we all have the usual sheets on our beds, along with woven cotton blankets and lightweight duvets. 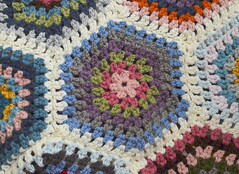 In the coldest weather, we add afghans crocheted by yours truly. Hello! Happy Monday. I hope your week is getting off to a good start. I want to talk about books today, specifically old favorites. I've always had a large book collection. I'm the kind of person who can read beloved books over and over again, without growing tired of them. It's good to have lots of books around the house, I think; you can always find something to do when you have a good assortment of books. They look nice too; I've always loved having bookshelves in the main areas of my home. We have three main ones for the Bear's books and my own, as well as another large one for children's books. They each have a bookcase in their bedrooms too, but those are more for board games and toys than books. The books stay out in the family room so they can both enjoy them whenever they want. I'm proud to say that both of my children are avid readers and both learned to read early. They read a lot and often want to discuss their books, which makes me really glad. As much as I love reading and having lots of books around me, there have been many times in my adult life where I've had to unload some of my books, whether because of a move (our cross-country move in 2006 hit my book collection very hard), or because I really wanted to make room for some new books, clearing out the ones I didn't love so much anymore. I don't often buy brand-new books; I'd rather save money with a used copy if I can. There's also something about a book that someone else has written in; I like to read old notes and see what another person highlighted or underlined, what they found important as they read. In college, I bought used books as often as I could, to save money mostly, but I always found it interesting to see what previous users had found noteworthy. Sometimes it helped my studies too. I was a good student, not a perfect one. Over the past few months, I've had the urge to replace some of the books I've jettisoned along the way. Not everything (I'll never have the room for it all; the whole place would be lined with bookcases along every wall), but a few really special books that I missed having in the collection. I started with Silas Marner last fall; I'd read it in high school and fell in love. It wasn't light reading, and in fact, I still find it slightly slow going even today, but I enjoy it very much. I re-read it as the seasons changed, as I normally do when I re-read it (large portions of the story take place around Christmastime and I like the feeling of reading a story in its season, if you will). For Christmas, I asked the Bear to replace a couple of other beloved books as gifts for me: Giants in the Earth by O.E. Rolvaag, and The Grapes of Wrath by John Steinbeck. Both are books I loved since I first read them in high school. I re-read them many times after that, but somewhere along the way, I needed to let go and they were donated. I felt it was okay to replace them now; I've cycled through some of the other books I'd since acquired, there was more room on the bookshelves, and I was in the mood to re-read them both. But more than all of this, I just felt like having them again. I'm not a particularly acquisitive person; I actually quite enjoy paring down and having less, and I don't splurge very often. In fact, both of these are used books. I specified to the Bear that if at all possible, I'd rather have used copies. I like dog-eared pages, soft, floppy covers and loosened spines. He came through; there must be hundreds of copies of the Steinbeck book available used on Amazon. The Rolvaag was harder to find, and a bit more expensive, but we tracked one down. It's a less popular book than the Steinbeck, but it's fantastic. Have you read it? The story is about Norwegian pioneers on the American prairie and the trials they faced in their rugged life. It's gritty and wonderful. Both of these editions are decades newer than the ones I gave away, but they've been well-loved. The Bear also gifted me with a third new-old book, The Cow Who Fell in the Canal by Phyllis Krasilovsky and Peter Spier. This was a favorite book when I was very little. Unfortunately, I was not able to take it with me when I moved away as a young adult (too many siblings, too many feelings, etc. ), and I missed my cow book. I knew my children would enjoy reading it and really wanted to add it to our library. I thought about it for several years but never made a move to replace it. The Bear did, though, and I'm so happy to have this book again! Oh, I can't even tell you. My new copy is paperback, like my old one, but this new one is much smaller. It's a newer edition, 1997, versus my old one from the 70's (I believe this book is now out of print in the US). It came all the way from England, where the seller is located. You know how much I love foreign mail; so much the better if it's an unexpected surprise. 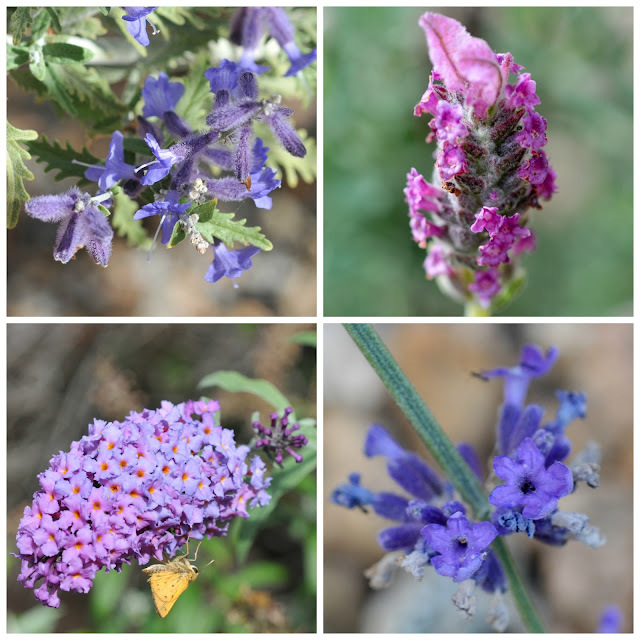 I want to show you a few pages from this sweet little book. It's a simple story, about a cow named Hendrika. She lives in Holland and she does the usual cow things: she eats grass, gives lots of creamy milk to make her farmer proud, and dreams of a life in the city, which she hears a lot about from her friend Pieter the horse. One day, Hendrika is eating grass by the riverbank when she wades too far into the water and falls in. At length, she ends up floating aboard a raft all the way down the river to the city, where she is involved in a series of mishaps, which include running free in a marketplace, eating straw hats and cheese, and getting chased by market vendors. City life proves to be quite stressful for our friend Hendrika. While she's on the lam, she encounters her farmer, Mr. Hofstra, who is not necessarily pleased to see her, especially as she decimates the cheese displays and gobbles hats. The city people are amused, but Hendrika soon realizes that the city is no place for a cow. The illustrations are so charming. I've never been to Holland, but I thought about it a lot when I was little. I loved the way the houses looked, and like Hendrika who had heard about them from Pieter the horse, I was fascinated by the idea of staircases on the roofs of Dutch houses. I also liked the wooden shoes and the round red and yellow cheeses. I've always been a fan of cheese. Back home on the farm, Mr. Hofstra tightens security and Hendrika reminisces about her adventure. She has gained a lovely straw hat of her own, which she wears while she eats grass in the pasture. She has realized that the farm is just the right place for her and she is happy once again. Gosh, I just love this book. I'm so glad I can share it with my kids, who have also enjoyed it over the past few weeks. Yay for new-old books! All-of-a-Kind Family, by Sydney Taylor (and subsequent books from the series, which I loved in elementary school). The Root Cellar, by Janet Lunn (my favorite book in fifth grade). The Westing Game, by Ellen Raskin (the LB would like this now and I just saw it at Costco last week, so I may need to pick up a copy next time I go). Mitch and Amy, by Beverly Cleary (we have all the Ramona books, and I love them, but Cleary's non-Ramona books are terrific too). How about you? Are there beloved books you would like to restore to your library? As a longtime proponent of Meatless Monday, I'm often looking for interesting ways to serve meatless meals to my family. I make lots of bean- or veggie-based soups, egg dishes, salads and of course, pasta. I like to make my own pasta sauces sometimes, but I'm also perfectly happy to use prepared sauces, especially pesto, which can be hard to make from scratch in the off-season. When I do make a sauce, I like it to be simple and quick (obviously) but also fully-flavored, and that's why my homemade sauce is often made in the puttanesca style. Have you eaten pasta puttanesca? It's one of my favorites. I had it for the first time in a tiny restaurant in Greenwich Village when I was 19 years old and it really stayed with me. The salty, spicy, tangy flavors are my favorite combination - it contains kalamata olives, capers, lots of garlic and a little bit of one special ingredient that I really want you to try if you haven't before - anchovy paste (a traditional puttanesca ingredient, the addition of which makes the sauce not quite meatless but pretty close). It's a thick, rustic-style sauce that I particularly love in wintertime. Pasta puttanesca originated in the Campania region of Italy and is said to have a...salty background. The word puttanesca is derived from puttana, the Italian word for prostitute. As the story goes, the women would prepare simple pasta meals in between clients. Some say they would even put their fragrant sauce pots on the open windowsills to tempt men. Now, I know this isn't the kind of discussion you usually get 'round the old Thistlebear home, but this sauce is so tasty and easy to make that I think most of us can overlook its suspect origins. First, heat the oil in a medium saucepan with the garlic and crushed red pepper (you can use more or less red pepper, depending on your threshold for spiciness; I like to keep it relatively mild so the whole family can enjoy it). Cook over low heat until the garlic is slightly golden, then add the anchovy paste and stir it into the oil, cooking for another minute or two. You can add the tomatoes to the pot once the anchovy paste has cooked a bit. While the tomatoes simmer, get the olives and capers ready. Sometimes I rinse the capers if they seem excessively salty in the jar, but usually I just drain them. I quarter the olives. I don't rinse them, though; I find that their brine enhances the flavors in the sauce. Finally, stir the olives and capers into the tomatoes and let the sauce simmer a little longer, five minutes or so, to allow all the flavors to blend. You can add fresh herbs, or salt and pepper to taste, but I usually find the sauce to be plenty salty (if salt is a concern in your diet, you can certainly adapt the recipe, bearing in mind that olives and capers do tend to be high in sodium). Serve the sauce over hot cooked pasta with grated Parmesan. Mangia, ladies (and gents...tee hee). I've been feeling reclusive lately. I'm not really sure why, but it feels like the right thing to do. I cherish my alone time, which for me amounts to four mornings a week while my children are in school. Staying home in the mornings is mostly a restorative thing. I'm trying to use the time to do things I don't have time (or energy, or peace) for otherwise, like reading and sewing. 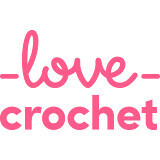 Crochet can happen almost anywhere; I often crochet in front of the TV, and I take small projects with me on the go. More than the hobbies, it's just good to have some quiet in my day. I feel like my children are getting louder all the time. They're happy, and it's wonderful, but oh, the noise! And I've only got two. I've felt really stressed out for a couple of months with the LB's medical stuff - not the boy and his needs, but the endless cajoling, arguing and pleading with people at every level of the healthcare chain. I often make my phone calls in the mornings when I'm alone, which can detract from the peacefulness in a big way, but it's a time when I can accomplish things I need to deal with. I can't say I feel restored by this, but it feels good to strike something off the list (even if it does contribute to my reclusive ways and overall grumbliness). What's your best time of day? Morning all the way, for me. I prefer to do almost anything early in the day - housework, baking or cooking, paperwork, doctor's appointments, grocery shopping. I think more clearly and I feel fresher, healthier somehow. I think I look better too - my hair hasn't lost all its body yet, my always-minimal makeup still looks like it was applied by a grown-up, my clothes are still neatly arranged. I use fewer swear words. I think I lose my grip by about three in the afternoon and it all goes downhill from there. Are you having a good weekend? It's a quiet one here. Cold and sunny outside, just how I like it. I have some new library books. I'm still working away on Hensfoot, and I ordered some yarn this week for a future project, a new super-sized afghan for our bed, which I have promised myself I WILL NOT START until Hensfoot is done and dusted. I hope to start a cross-stitch project soon. This is such a good time of year for it; the sun shines into our living room most of the day and I can sit in the window with bright light behind me. Guess what? We bought a new car this week. Like, a new-new car. I've never had one before, so I'm very excited. We got to choose the colors and everything. It's for the Bear to drive (his 1999 vehicle barely functions at this point; my 2006 still has plenty of life in it), but I shall be hijacking as often as possible. 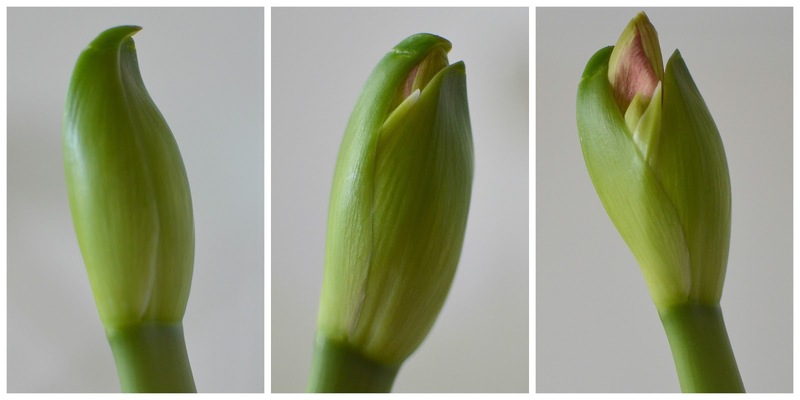 I can't even tell you how much I have enjoyed having an amaryllis in our kitchen this winter. 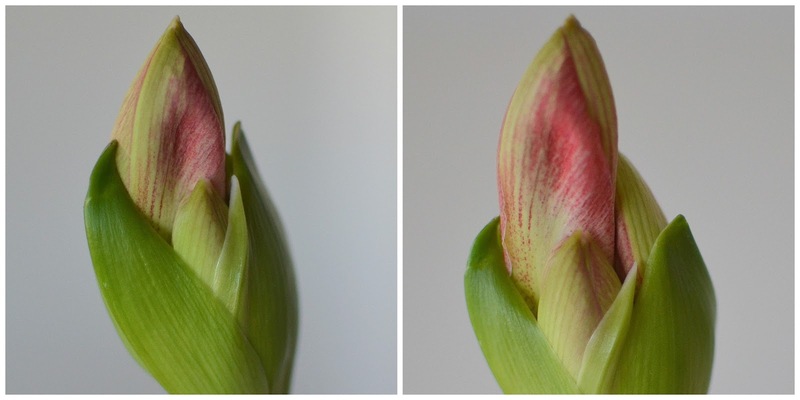 Watching her bloom has been a daily pleasure and a peaceful ritual during the busy holiday season, a bit more beauty with each passing day. Now she blazes on the kitchen table, warm and bright in the cold heart of winter.